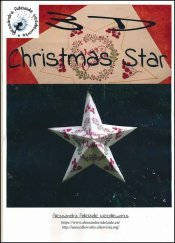 3D Christmas Star [J8948] - $2.00 : Yarn Tree, Your wholesale source for cross stitch supplies. Cross stitch pattern by Alessandra Adelaide Needleworks. The "Christmas Star," has Merry Christmas stitched in the middle with greenery around the Merry Christmas. Holly is stitched on each of the points of the star. Stitch count 334 x 318.